Nintendo and Microsoft have once again failed to find favour with eco-watcher Greenpeace, both scoring the lowest marks in the NGO's latest Guide to Greener Electronics report. But they're not the only consumer electronics firms criticised for being too slow to get serious about climate change. The Guide – now on its tenth edition - ranks 18 leading electronics firms according to its own energy, e-waste and chemicals criteria. For example, use of Earth-damaging substances in products will get you a low score, while using solar energy to power PCs will get you a higher marks. Greenpeace said the new Guide revealed that most of the firms talk the talk but in reality "show little engagement" with the issues of sustainability, climate change and pollution. Only a minority of those companies scrutinised lead the way on energy and climate change, Greenpeace said. Motorola, Microsoft, Dell, Apple, Lenovo, Samsung, Nintendo and LG are all “lagging behind”, Greenpeace said, having no plans to cut their operations' emissions, no support for generic targets and no timelines in place to “avoid catastrophic climate change”. Nintendo scored 0.8 points out of a possible ten this time around, and remained in last place. The videogames giant scored poorly in many areas, most notably for failing to use sufficient recycled plastic content and energy from renewable sources. Microsoft came in second to last position with a score of 2.9. Greenpeace criticised the software giant for its continued use of harmful chemicals, including Brominated Flame Retardants (BFRs), in its products. But the eco-body praised the firm for reporting its total carbon dioxide emissions and for the use of energy generated from renewable sources. PC manufacturers make up much of the report’s middle ranks. Apple received 4.3 points. Greenpeace praised the company's elimination of PVC and BFRs from its Touch and Nano iPods, and for its publication of carbon footprint stats. The Mac maker scored badly on e-waste criteria, though, because it doesn’t publish information about the amount of recycled material used in its packaging. HP scored 4.5, while Dell and Acer each got a score of 4.7. Nokia took pole position with a score of 6.9, although it’s worth noting that the handset firm’s score dropped from 7.0 in version nine of the report, because it still hasn’t committed to reducing greenhouse gas emissions. The phone giant was praised for its product take-back scheme and for its commitment to removing harmful chemicals from products. Samsung scored 5.9 points. Greenpeace was impressed by the firm’s partial eradication of BFRs from its handsets, along with use of recycled plastic in product packaging. Sony Ericsson leapt ahead too, coming in joint second place with Samsung, thanks mainly to creation of a product take-back and recycling scheme for customers. Toshiba, like Samsung and SE, also scored 5.9. The PC firm’s jumped up three positions because it now reports on its use of renewable energy and supports cuts in global greenhouse gas emissions. Motorola was fourth from the bottom in the last report, but it’s now fifth from the top spot because it’s set a goal to eliminate PVC and BFRs from all its products introduced after 2010. Sharp was awarded 4.9 points and fell in line with rivals Acer and Dell, marking a vast improvement on its third from bottom position in the last report. Greenpeace said Sharp scored well this time around because it’s launched several LCD TV models free of PVCs, and because it’s committed to eliminating a harmful chemical – phthalates – from all of its products by December 2010. 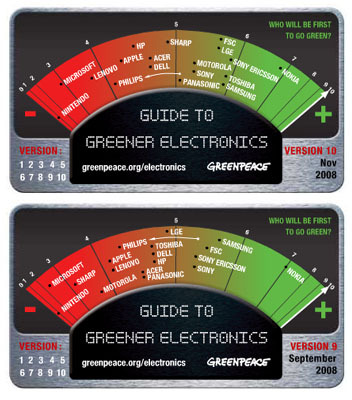 The full version of Greenpeace’s Guide to Greener Electronics version 10 is available online.